A wheel is composed of three main parts: the spokes, the rim and the tire. The tire is the outermost surface of the wheel that comes into contact with the road. It connects to the rim of the tire, which is simply the outside edge of the wheel. A tire covers the rim of the wheel to both protect the rim and help your vehicle absorb shock and increase performance. Without all three parts, the safety and performance of your tires would be greatly reduced. 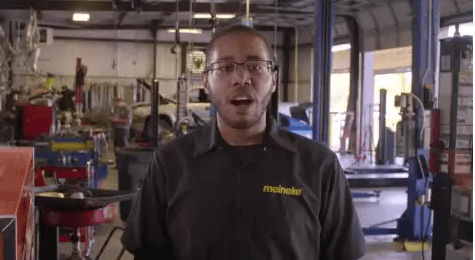 To learn about tire repair service, contact Meineke #266 in Joliet, IL. Keeping your tires in optimal condition is important for a myriad of reasons. First of all, well-maintained tires handle better on slick and uneven surfaces. Their ability to handle these surfaces means that you and your passengers are less likely to be involved in a collision. Tires also have a significant impact on your suspension system, and if they are not rotated periodically, you may have difficulty steering your vehicle. Tires are frequently overlooked by drivers, but the better your tires perform, the better your entire vehicle will perform. Stop by our Joliet, IL, Meineke #266 store for a comprehensive inspection today. What are some signs that you need your tires or wheels repaired? Some may seem fairly obvious. A puncture or blowout will typically have you on the computer or phone researching all of your "flat tire repair near me" options. However, there are other, less subtle signs that your wheels or tires are in need of service. One may be if you experience issues with your vehicle's performance, such as a noticeable shaking in the steering wheel or the entire vehicle whenever you go above 40 mph. Another may be uneven wear across the tread of each of your vehicle's tires. A quick balance or tire rotation service done at Meineke #266 in Joliet, IL can help you avoid ending up getting stranded on the side of the road. Neglecting to inspect or replace your tires can be dangerous in the long-run. If your tires are worn down, you may have difficulties handling your vehicle during adverse weather. Sleet, rain, and ice can easily send a vehicle with little tread spinning. During rainstorms, your vehicle will be more susceptible to hydroplaning, and you may experience longer stopping times and distances. Both of these issues have the potential to cause severe injury to drivers and passengers. Naturally, we want to help you avoid such situations. Contact our Joliet, IL, and Meineke #266 to schedule a professional inspection of your tires. Your tires will typically give you plenty of notice that you should look into tire replacement or repair. Low tire tread is a serious problem that can only be solved through replacing the affected tire and its twin. Cracking, noticeable wear on only one side of the tire and vibration coming through the steering wheel are all indicators that you should have your tires inspected by a professional. If you do not replace your tires promptly, they could pop while you are driving. Taking your car to Meineke #266 in Joliet, IL for a full tire inspection and tire repair is the best option for safe driving. Because tires are your vehicle's only direct contact with the road, they should always be kept in the best possible condition. Tire rotation cost is a small price to pay to ensure that your vehicle is safe. Moreover, you can actually increase your fuel mileage by keeping your tires well repaired and maintained. Save money in the long run by taking your car or truck to Meineke #266 in Joliet, IL for inspection, maintenance and repairs. We offer competitive pricing and tire rotation coupons to help you experience the best savings possible without compromising safety.